A Research Update by Peter Moon, P.E. I have researched alternative stall bedding materials for horse farms and stables with the hope of finding a product that performs as well or better than straw or wood shavings and can be composted to produce a superior, marketable finished compost product. In my opinion, wood pellets achieve these goals and will soon become the next generation in horse bedding nationwide. I am excited to pass along some information about horse manure composting and the use of wood pellets as an alternative bedding material. Clean out the stall down to the floor (dirt, wood, concrete, rubber mats). Place the contents of three to five bags (40-pounds each) in the center two-thirds of the stall, and spread the pellets out to an even depth of roughly 2 inches. Alternatively, you may also locate the bedded area where the horse prefers to “go”. The number of bags used will depend on the size of the stall, climate, horses’ habits, and personal experience from working with the bedding. Next, lightly moisten the pellets with 2 to 3 gallons of water to initiate their opening to a "fluffy" consistency. (I think this is the secret to success with wood pellet bedding.) The water serves to break down the resin sheen on the sides of the pellet. The amount of water used will depend on the humidity of your area and may vary at different times of the year. For deeper bedding, you may choose to add one or two more bags on top and again moisten with 1 to 2 gallons of water. Deeper bedding is not always advantageous, and therefore some experimentation is appropriate to optimize product use. Because they are highly absorbent, it’s OK to be stingy with wood pellets. Within 20 minutes of wetting, the bedding will expand to approximately 3 to 4 times its original depth and it will take on a much softer texture and a whitish color. It will continue to “grow” somewhat over the course of the first week. Approximately once a week, up to 1 bag of new pellets will need to be added to compensate for the amount of manure and saturated bedding taken out of the stall. Note: these new pellets should be scattered evenly and do not need to be wetted down when they are added to the mix. 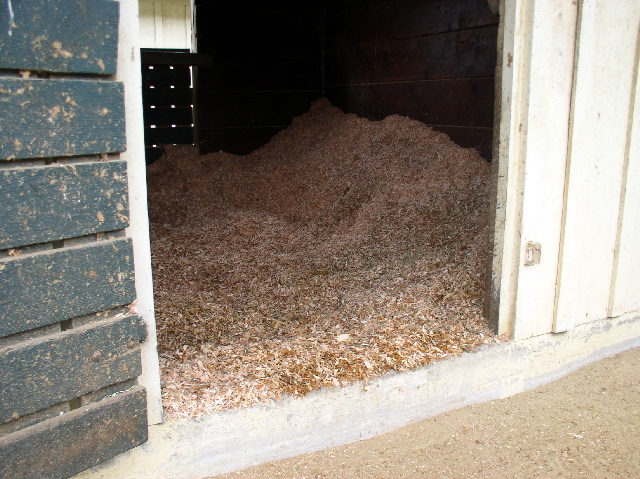 Many horse owners who use pellets strip the stalls once every two or three months, instead of weekly, thereby saving a considerable amount of waste volume and significantly reducing the cost of bedding and labor. Because the solid manure separates so easily from the fine wood fibers, very little of the bedding is actually removed from the stall. 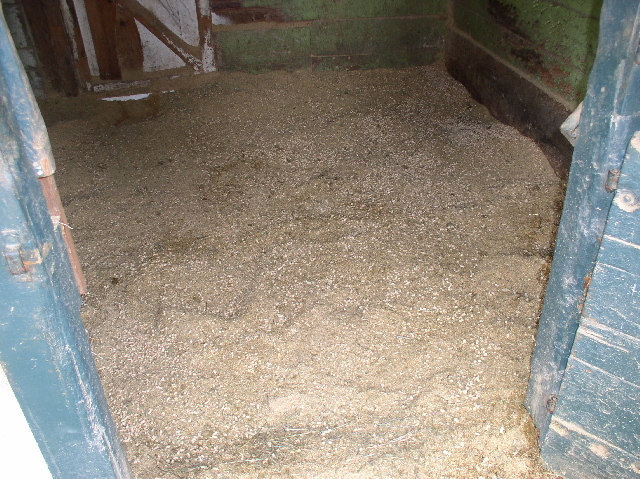 The urine saturated areas should be removed entirely, leaving only dry to moist bedding (Key: Do not scatter the saturated bedding, as some brands suggest, as this will lead to ammonia odors and necessitate mucking out the entire stall before the material has been fully utilized). Many people ask me which brand of wood pellets are best for horse bedding, and whether a wood stove pellet can be substituted to save on cost. Allow me to attempt to answer this question by beginning with a brief history of wood pellet production, based on conversations with people whom I consider to be reputable wood pellet manufacturers in British Columbia, Canada. The concept of wood pellet production came about many years ago as a way to utilize thousands of tons of waste sawdust from the wood products industry. They were originally used as a fuel source for large boilers and later for home owners with smaller wood pellet stoves. The quality of wood fuel pellets is determined in part by the moisture content (typically very low at 3 to 4%), the BTU value, and the ash content after combustion. It is my understanding that a wide variety of wood types are used for producing wood fuel pellets, and that the percentages of any one type will depend largely on availability. It is also rumored that wood stove pellets occasionally include fine sawdust from furniture and cabinet manufacturers as well as glues and resins used in the fiberboard and laminate industry. Wood pellets used for horse bedding originally involved the same exact wood pellets as used for fuel. Because of dust problems with many of these products, further refinement in the manufacturing process lead a few producers to a pre-screening step to remove the finest dust fraction. Much of my experience with wood pellet bedding involves various brands manufactured in British Columbia, Canada. These brands are most frequently produced from pine sawdust, where northern lodge pole pine is common in the wood products industry. Because the source of pine sawdust is abundant and highly controlled, these materials are considerably purer and more predictable than wood stove pellets. Wood pellets for horse bedding is a rapidly evolving industry, with more manufacturers coming on-line each year. As high-quality shavings become increasingly difficult to obtain, and the cost of manure management continues to increase, I believe wood pellet bedding will become the norm within the next few years. Having said all of that, I find that the decision of the type and brand of wood pellet to use (e.g., fuel pellet or horse bedding pellet) is ultimately a subjective one, and should be determined based on experimentation and personal preference. For those inclined to research, a few telephone calls to three or four manufacturers may help clarify the decision. Keep in Mind... online research (and a friendly tip) tells me that black walnut and butternut material in stall bedding can cause laminitis or founder in horses. Therefore, choose carefully and when in doubt, stick with pellets that have been manufactured specifically for animal bedding. What you will definitely experience with any brand of wood pellet is a dramatic reduction of waste volume; often exceeding 60% to 70% when compared to shavings and considerably more when compared to straw. This point is of key importance in developing and implementing an effective manure management strategy. My suggestion is to try a wide variety of wood pellets and decide which works best in your situation. I also urge you (no, implore you) to not make your decision based on product cost alone, as many other factors come into play, including dust, moisture holding capacity, ease of handling, and longevity. There are also many other factors to consider when evaluating the total economics of a manure handling system, including product availability and predictability; storage and handling; and labor to place bedding, muck stalls and transfer waste to the receiving area. Finally, compost produced from horse manure and wood pellet bedding yields a far superior compost and hence it has a higher market value. It is important to understand that the materials going into the compost pile predetermine the quality of the compost that comes out of the pile. Horse manure alone (i.e., no bedding) makes excellent compost, increases soil health and moisture holding capacity, and stimulates plant growth. Horse manure has the correct Carbon to Nitrogen balance (C:N), moisture content and bulk density (i.e., porosity). In the case of horse manure mixed with shavings, the initial compost mix has a very high percentage of carbon based bedding material and this results in high carbon compost. This often results in nitrogen “fixing” in the soil, which can be detrimental to plant growth. For this reason, high carbon compost is often used as a mulch (i.e., top dressing) and generally has a lower market value. Also, the lignin in the wood is very resistant to decomposition, leading to the expression, “Shavings In – Shavings Out”. With horse manure and wood pellet bedding, there is a significant reduction in volume of wood mixed in with the manure and therefore it is much closer to the ideal C:N ratio. In addition, the wood particles that are in the waste are fine textured (i.e., have a very high surface area), thereby exposing more of the wood surface to the microbial (bacterial and fungal) activity. As a result, the rate of composting increases dramatically and the finished product quality is far superior to that of shavings-based compost. I work closely with researchers at the Washington State University Cooperative Extension Service, in Puyallup, Washington. They are very interested in the fate of horse manure in urbanized areas, potential impacts to surface and ground water, and benefits to the soil when these materials are composted and used as amendments for both food and ornamental crops. WSU recently completed a series of laboratory tests involving raw and composted horse manure, with both wood pellets and wood shavings used as bedding material. The results of this investigation are summarized in the following table. With a mix of manure and wood pellets, the Carbon to Nitrogen ratio (C:N) of the finished product is below 20:1, and as such the nutrients contained in the compost will be released to the soil and plants. In the case of shavings / manure mix, the C:N is nearly 70:1, and in this case nutrients will be drawn from the soil to continue the decomposition of the wood fraction. This latter condition is clearly disadvantageous in every regard. It should be noted that in both cases the compost tested was produced using the aerated static pile method, which induces airflow through the mix of materials to maintain aerobic conditions throughout the pile and enhance microbial activity. By maintaining aerobic conditions, odors were controlled, pathogens and weed seeds were destroyed, and the composting process was expedited. In both cases, the material was handled just twice: the first time to place the waste into the aerated bin or bay and the second time to remove it again and load it out for final use. I have provided an alphabetical list of links to wood pellet manufacturers. This is not a comprehensive list, and I would be interested to learn of any other brands that can also be included. Please send them to me if you come across other brands, and I will add them to the list. Place 1 cup of your bedding material (tightly compacted) in a one-gallon size zip lock bag. Place 1 cup of any wood pellet product (horse bedding or fuel) in a second one-gallon size zip lock bag. Add 1 cup of water to each of the bags, seal and observe continuously for 5 minutes and then again at the end of 30 minutes. I believe that you will be amazed at the difference in absorption. Select two stalls, one with a horse that has "good manners" and one with a horse that is "a pig". For two weeks, use your current bedding material in these two stalls and muck them out in your normal fashion. During this time, estimate the volume of waste material that comes out of these two stalls (i.e., how full is the wheelbarrow, or how many wheelbarrows?) and monitor how long it takes to do a thorough job. Next, strip both of these stalls down to the rubber mats and set them up with wood pellets, as described at the top of this discussion. Use a wood pellet product of your choice (i.e., fuel pellet or horse bedding pellet). I have found that the brand of wood pellet is a matter of availability and personal preference. During the next two weeks, clean the two stalls out with a manure fork (apple picker) to pick up the solids and a square nosed shovel to collect the urine-saturated areas. This may require some practice, but this will come in handy later when you instruct the stall cleaner how to avoid over-cleaning the fresh bedding materials. As before, estimate the volume of waste material generated and monitor how long it takes to do a thorough job. Compare the total volumes and times at the end of the one-month trial. Use these numbers to project the total volume reduction and time savings for your total operation. Lastly, give me a call and let me know how it worked out for you. The information that you derive from this experiment will serve as the basis for sizing an aerated compost system appropriate for your farm or stable, and I may include the data on this page at some future date. It is important for you to know that I am not a "horse person" as such. I’ve been around horses for years, but most people introduce me by saying, "I’d like you to meet Peter Moon - he’s the manure guy that I was telling you about". In terms of wood pellet quality, I rely on other people’s experience and opinions (and sales pitches), and I have tried to pass along only the most credible information. In terms of the manure (i.e., the raw materials that go into the compost pile and the finished compost that comes back out), you can count on me for a well informed appraisal. I do not market or endorse any particular brand of wood pellets. My goal is to minimize the amount of carbon that goes into the compost pile, regardless of the bedding type. Zero bedding is preferred overall. Further, I am interested in helping stable owners minimize the cost of their manure management obligation. My ultimate goal is to help horse owners realize a positive return on their investment in my compost systems, and to develop a new profit center for their business, farm or stable. Thank you for the opportunity to provide this information on the benefits of composting horse manure and wood pellet bedding. I believe that this is a higher and better use of these materials and represents a “Full-Cycle / Recycle” opportunity. It also provides the horse owner / stable manager the possibility of decreasing expenses and creating a profit center for the farm. For further information, please refer to Training Programs or Contact Us.